Pit Bull Hard Anodized Rear Sprocket, combined with a case hardened, electroless nickel plated, steel front sprocket and your choice of RK or DID chain. 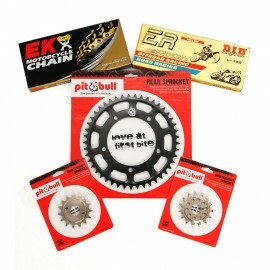 See our Sprocket Ratio Chart under Fitting Charts. The Pit Bull Trailer Restraint System is a revolutionary way to transport your motorcycle using a combination of features never seen before. It holds the bike from its rear axle and allows both tires to rest on the floor of the trailer or transport vehicle. 1) There are no straps holding the bike down. This minimizes the space used in the trailer and eliminates the chance of damage caused by straps. 2) The motorcycle rests on the trailer floor with no added force on the suspension. This means no more blown fork seals caused by heavy strap tension, and a flat tire on the bike will not change how securely the bike is held. 3) This is the quickest, easiest system available for loading/unloading your bike for transport. One person can easily roll the bike into place until it is captured by the restraint. Everything you will need to secure your bike to your trailer is included in the price (bike-specific pins, hardware, etc.). 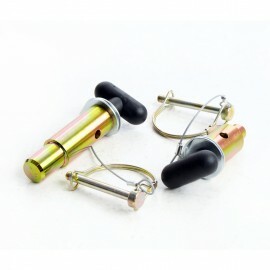 Although, other accessories are available only if you need to use them for additional bikes and/or mounting locations. (See 'Related Items' at bottom of the page). .
Love this stand. I would disagree with the tire warmer point. I have used tire warmers on fresh pirelli race rubber and it fit fine. Can't wait to more products and make my life easier! Purchase directly from Pit Bull and transaction was flawless. Once I received the items I notice that the pins weren't working properly ( to long on clutch side.) I called them and explained the situation, they had me take pictures and measurements. THEY sent me custom pins for my bike and had me send to others back to them. That's going above and beyond customer service, they have a lifetime customer in me. PS I have a trailer restraint system for my 2017 KTM Super Duke R as well. Not only does it work well for my 2016 Honda CTX 700N, it also fits my 2014 Suzuki S40. For the S40, the pads are a bit close to the axle nut, but it is a solid safe stand. Great stands and of the highest quality. I wouldn't buy another stand. Only complaint is that the headlift stand presses on the underside of the front fairing on my 2007 Daytona 675 when the bike is lifted. Firstly, great website with all the info you need to select the proper stand and spools for your motorcycle. Absolutely love this stand! Amazing quality metal and welds.Definitely a built to last product and you cant go wrong wiyh the ss model because you can adjust your spools to your bikes then mark it with a sharpie then boom you can flip it around and help out a buddy.It came very well packaged and best part of all is its made in america!Highly recommend and love how they offer the refurbishing kit for later in its life. Headed to a mini track soon with my Z125. I ordered these pins, was immediately informed during the checkout process that they're custom produced, not on hand. I was sent a courtesy email updating me beyond the standard order processing & shipping emails. The customer service was perfect as always. Received them, as promised yesterday, checked for fitment as soon as I got home. Perfect. Best tool in my garage! I have a V7 III Racer that I wanted to keep vertical when not ridden and for service. There are no receivers for conventional stand bobbins on this bike. I have 3 other Pit Bull stands for other bikes, so I was familiar with the their good quality products. I just got this stand, and I can say it is the best thought-out and best engineered one yet. The V7 III, with relocated evap canister, only has a single horizontal tube on the frame to support the bike with, but this stand does this very well and keeps the rear wheel low to the ground and very stable. Height is adjustable, but mine is on the lowest setting. This is a great way to support and service your bike without lugging around a permanent centerstand. The V2 version is very easy to deploy, too. Thanks for a great product! Lifts the front of my 1199 Panigale but how are you supposed to get the axle out? The bars of the stand block the front axle. From Pit Bull: You'll just need to turn the handlebars in order to have axle clearance. On some bikes, it'll be wide open whereas on others you'll just need to turn the handlebars a bit. I own this constraint system for my Hayabusa dragbike and have been using it for 8 years now. I have seen many different motorcycle constraint methods over the years and must say that pit bull's constraint is the most efficient and simple motorcycle constraint product that I have ever seen since buying it. So far, my constraint shows no wear nor tear and I use it at least two times most months, with each use averaging two to four days use each time. It is extremely stable holding my bike and is very easy to load, taking about one minute to do so. I have never used any additional strapping, etc, to keep my bike steady. Lastly, my trailer floor is still in good shape where the mounting plates mount--no issue here. GREAT PRODUCT! I have made the trip across Canada and the USA once a year for 4 years now and take my Ducati with us. We have tried various trailers and strap methods to keep the bike safe while traveling, but always had to stop and readjust straps and keep things tight. The past year we purchased an enclosed trailer and a pit bull trailer restraint system, we traveled across Canada and the USA and back for a total of 11,000 miles and that bike was rock solid! I used straps on the front as an extra precaution and after we stopped a few times and I realized the straps had come loose and weren’t doing anything, I took them off and put all my faith in the pit bull system, it did not let me down! Simply awesome! Will only use it for our bikes now. It is a must have!! So I was hesitant at first to use this product because I'm old school strap kind of guy. I pulled the trigger on it and I wish I'd done it sooner, it so much easier to load and secure the bike. On first use I have way expected to open my trailer door and see my baby on the floor, I was pleasantly disappointed ( it was upright). Would highly recommend this product as the preferred method of secure a bike for transport. Works perfectly. Solid product and great people to work with.